Mars begins retrograde motion on November 15. That means it’s moving backward. If you plot the path of Mars (or any outer planet) on a star chart each day, you’ll find that most of the time planets, like the sun, move eastward compared to the stars. 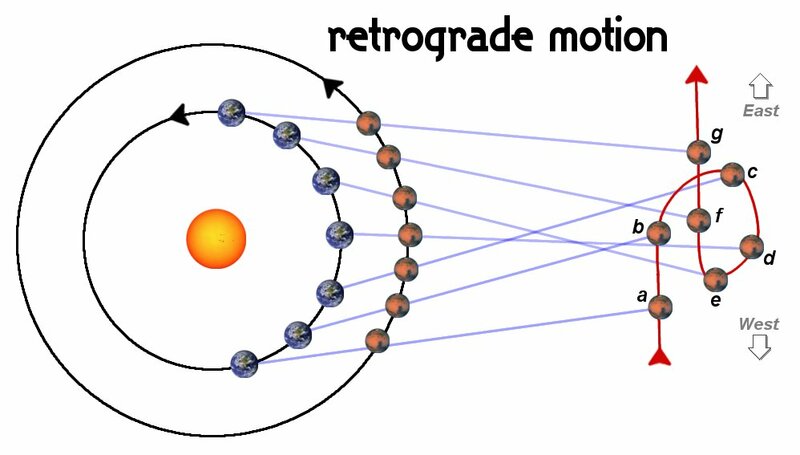 But every now and then, planets loop back the other way for a little while: retrograde motion. When a planet is retrograde, it will make a loop or an “S” on the star chart, moving westward for a while before turning back to its normal eastward course. Back in the early days of astronomy, this caused endless problems. If the planets are attached to crystal spheres moving in perfect circles around the Earth, why would they ever change direction? Ptolemy and others came up with ever more complicated explanations for retrograde motion, like “epicycles” (the planets aren’t attached firmly to that crystal sphere, but instead swing around on a little wheel, and it’s the center of the wheel, not the planet itself, that’s orbiting the earth in a perfect circle). Then it turned out those didn’t quite match the planets’ motion, so the epicycles had to be adjusted some more. But when you find yourself needing to add patches upon patches to your explanation, it’s often a sign that your basic theory is wrong. When Copernicus and Kepler came along, the theory got a whole lot simpler, and at the same time more accurate. Turns out retrograde motion is simply a time when the Earth, inside an outer planet’s orbit, is “catching up” with the planet. The diagram should help in understanding what’s happening. We’re looking down on the solar system (not to scale) from the north. At first (a and b) we see Mars moving in its normal eastward direction against the background stars. But at (c), Earth is catching up with Mars, and from our perspective, Mars appears to stop its eastward motion (an ephemeris like the Observer’s Guide will note that as “Mars Stationary”, and this November it happens on the 15th). At (d), it has reversed course and is moving westward in retrograde motion. At (e) it’s stationary again, and at (f) and (g) it’s back to its normal easterly motion. You may notice from the diagram that a planet’s retrograde motion happens near its opposition. In November, Mars is still more than a month short of opposition - that won’t happen until Christmas - but it’s close enough now, and bright enough, that a telescope will show quite a bit of detail if you’re willing to stay up late. Happily, this year Mars transits quite high in the sky - 77 degrees now, and nearly 80 by opposition - so although it’s not as big as it appeared a few years ago, you should be able to crank up the magnification and see quite a lot of detail. So break out those short eyepieces and start practicing for the opposition next month! Meanwhile, there are a few planets to watch. Jupiter is a sunset object: you can catch it in the evening twilight, but don’t expect a lot of detail. On the night of November 4th you can catch a double shadow transit, Io and Europa and both of their shadows, starting just after sunset at 5:28. Jupiter will be low in the sky but still several hours from setting. Double shadow transits are common in some years, but this year they’ve been surprisingly rare in our time zone, so this is a nice chance to catch one before Jupiter disappears into the sun’s glare for the rest of the winter. And by the way, when you look at these times, remember that we’re finally back in Pacific Standard Time. The first Sunday in November is our new ending time for Daylight Savings Time, a week later than usual. Saturn rises a bit after midnight and is visible, though low, for the rest of the evening. Venus and Mercury both shine in the morning sky throughout November. But if you’re not an early riser, try this daytime challenge on November 5: find the moon (a thick post third quarter crescent), then swing about three and a half degrees (that’s about 7 moon diameters) upward and try to spot Venus. Amaze your friends by finding a planet in the daytime! You may be surprised at just how bright Venus is once you find it: you can probably see it with the naked eye if the sky is clear of clouds. The asteroid (1) Ceres is at opposition on the 9th. At magnitude 7.2 it’s not quite bright enough to see with the naked eye - (4) Vesta is the only asteroid that bright, but it should be easy to see in any telescope, or even in binoculars if you’re patient. The same rules you’d use for Pluto apply for asteroid hunting: you won’t be able to resolve it as a disk, so you’ll need a good star chart to help you figure out which of those pinpoints of light is the one you’re after. Then go back a night or two later, look at the same field and see how far the target has moved. On Friday, November 2-3, the third quarter moon will occult Regulus in the wee hours of the morning. We haven’t had many occultations visible here this year, so if you’re up late that Friday, check it out.